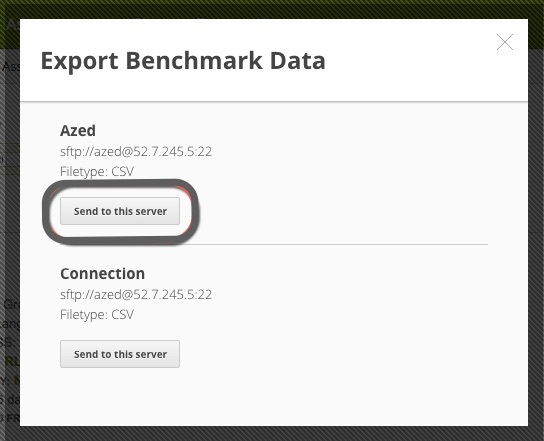 To export benchmark scoring data, make sure you've set up a server connection first. For more information on this, please see our Manage Data Export Connections article for more information. Click on Admin, then hover over Assessments and click on Benchmarks. Find the assessments you want to export scores from. You can search for the benchmarks by filtering the subject, created by, status, or when the assessment was delivered. Select the check box for the benchmarks you want to export. Click on the Export button, and select Send Scores to Server. Find the server you want to send scores to, and click on Send to this server. After the export is complete, you'll see a message that the benchmark has been sent successfully.